Earlier this afternoon frontrunner Telefónica discovered the leading edge of the cold front that is travelling at about 40 knots that will enable the team to begin a rollercoaster ride that is expected to last for 24 hours. This is their only opportunity for a chance at the monohull world 24-hour distance record. But they will need to average over 24.84 knots to beat the record of 596.6 nautical miles (nm) set by Ericsson 4 in the 2008-09 race. 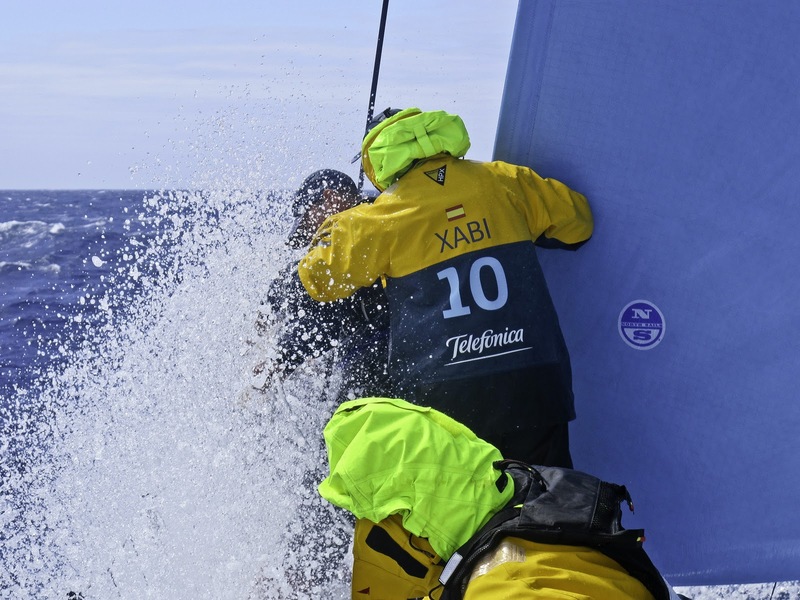 Team Telefónica has averaged 23 knots since noon today. According to Mike Sanderson, previous race winner with ABN AMRO ONE in 2005-06 and skipper this time of Team Sanya, “records come to you, you don’t go chasing them”. Sanderson should know, as ABN AMRO ONE also held the distance record of 546.14 nm in 2005 before it was toppled by sistership ABN AMRO TWO clocking 562.96 nm in 2006. Regardless of breaking the record, Team Telefónica is making everything secure on the boat in anticipation of a wild ride through the darkness and some exhilarating high-speed sailing. In a call to race headquarters earlier today, navigator, Andrew Cape said: “We’re under control. The next day or so is going to be quite exciting for us. We’re at the beginning of a front so the breeze is building up to about 25-30 knots. We’re already averaging 24 knots so it’s already getting a bit spooky,” he said. 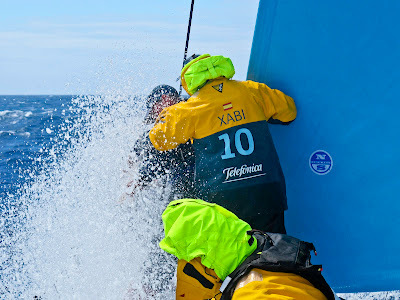 Telefónica is 118 nm ahead of chasing yacht CAMPER (Chris Nicholson/AUS). Cape says the team is very comfortable with their position in relation to Nicholson and his men. “We’re 50 miles due south which is very important. We get a better angle on the breeze and we ride the front for longer. They will get the lighter airs earlier. We will to keep an eye on them and make sure we don’t leave ourselves exposed,” he explained. Computers are predicting an overnight finish in Cape Town this Saturday for Telefónica. Groupama 4 (Franck Cammas/FRA) meanwhile is still trying to negotiate the Saint Helena High, 24-hours and 324 nm behind Telefónica. “The low pressure, which is coming south of the high, in the roaring fifties, will help us. This front will send us some winds to help us going forward,” explained navigator Jean-Luc Nélias. For Groupama 4 it is a case of spending the next six days trying to avoid the low wind areas created by the high pressure. As we look forward to the sleigh ride for Telefónica tonight, representatives from Volvo Ocean Race timing partner, IWC Schaffhausen will be watching carefully. The company will present each member of the sailing team who achieves the greatest distance in 24 hours throughout the entire race with a timepiece, as well as presenting a prize for the fastest run on each of the nine legs of the race. Perhaps, in the next 24-hours we will have a worthy winner.